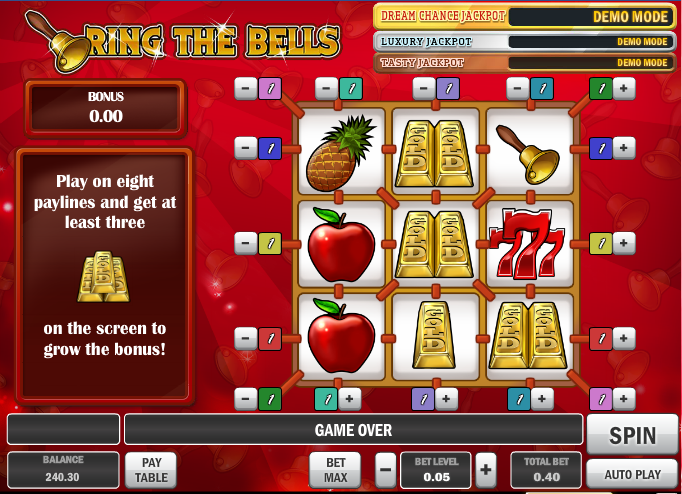 There’s nothing wrong with dipping our toes into a three reel online slot every now and again and in this review we’re going to check out Ring The Bells; it’s from Play No Go and the good news is that it’s part of that company’s progressive jackpot network which means there are always some pretty impressive prizes on offer for the luckiest players. There are also a couple of bonus features which is a little unusual for a three reel slot. Ring The Bells plays out over three reels and eight paylines and essentially you are playing on a 3 x 3 set. There are some basic fruity symbols including strawberries, lemons, apples and pineapples and then some sevens, bells and gold bars. As well as the eight paylines, you can also win with matching symbols in all four corners; additionally, just one strawberry is enough to pay back your line stake. The bells and the gold bars are also bonus symbols which activate the feature. You can trigger this feature by landing five or more of the bell symbols scattered anywhere on the reels; you will now receive a number of bonuses depending on how many bells appear on the reels. You need to have all eight paylines active to be eligible for this reward; whenever you land three or more piles of three gold bars on the screen the bonus amount in the top left hand corner will increase. That amount is won by matching all nine symbols on the reels with the same symbol and you will also win at least 25x the total bet. Three gold rings – play the bronze wheel of fortune with a chance to win a cash prize, the Tasty Jackpot to or move on to the silver wheel. Four gold rings – play the silver wheel with a chance to win a cash prize, the Tasty Jackpot, Luxury Jackpot or to move on to the gold wheel. Five gold rings – play the gold wheel with the chance to win a cash prize, the Tasty Jackpot, Luxury Jackpot or the Dream Chance Jackpot. This is a little out of the ordinary and if you select to gamble your most recent win you will play against the dealer; he will play a card and you must choose one of five available which you hope is of a higher value. Give yourself the best chance of winning the progressive jackpot by playing with all eight paylines active and a stake of more than €0.10. Don’t let the fact that this is three reel slot put you off – there’s plenty going on here, not to mention the chance of winning that great progressive jackpot. Well worth some of your time.